The “Hazel’s Diary” Quilt has made its grand debut! Woohoo! Month One is in today’s Kansas City Star newspaper, in the House & Home section. Be sure to pick up a copy and let me know what you think! 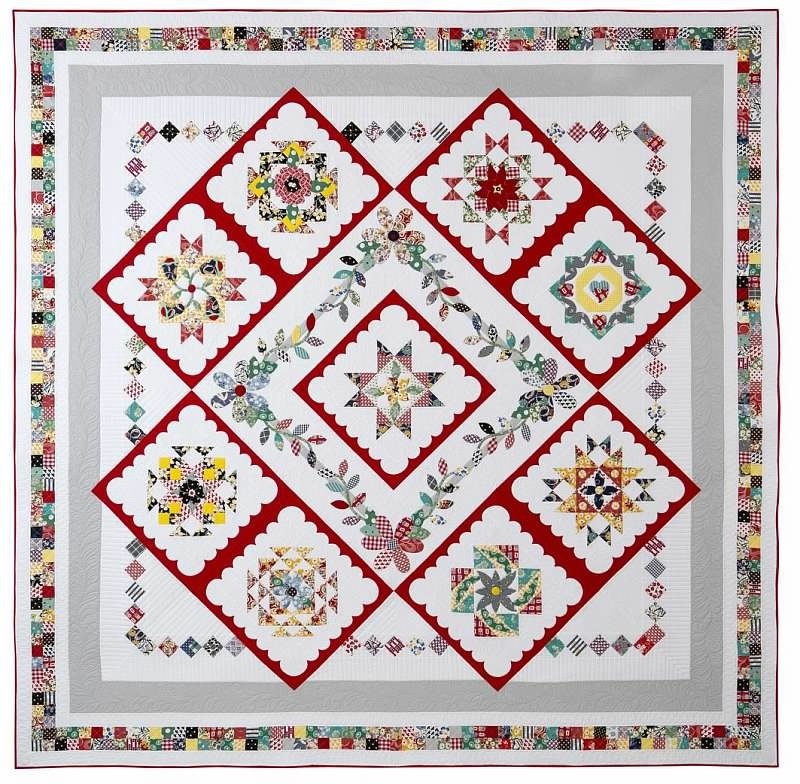 Our first block is based on the traditional Missouri Star quilt block, chosen because Hazel was born and raised and lived her entire life in Missouri. 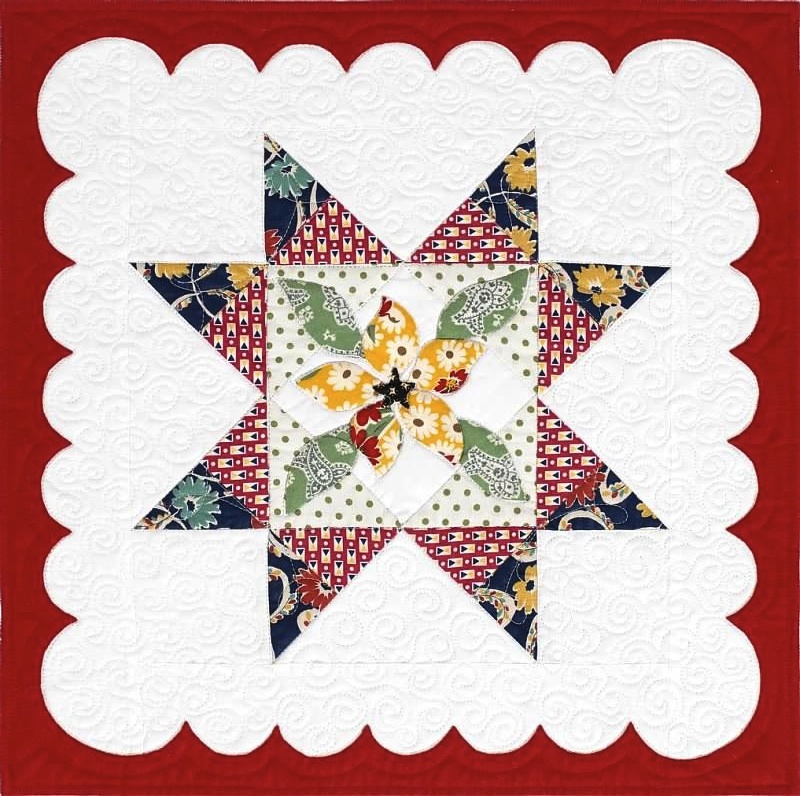 The wildflower applique sports five lovely petals, one for each member of Hazel’s family — Hazel; her mother, Mildred; her father, LaVern; and her two brothers, Donald and Larry, otherwise known as Buck and Puz. This block is the center medallion portion of the “Hazel’s Diary” quilt. Each month, on the third Sunday, another portion of the quilt will be presented in the House & Home section of the Kansas City Star Sunday paper. Don’t be intimidated by the scalloped red frames around the blocks. Tomorrow, on this very blog, I will be posting a detailed tutorial covering two different methods for attaching the frames — one for those who wish to use the fusible method, and one for those who prefer needle-turn. I’ll also furnish some links to some other applique information. The piecing and setting together of the quilt is very straightforward and simple, with no partial or set-in seams, in spite of the way it looks, so don’t be scared — jump right on in! If this is your first time visiting the Hazel’s Diary blog, welcome! If you’ve been here before, welcome back! You can download the PDF file for this installment HERE. If you’d like to read the diary from the beginning, just click HERE to get started. If you’d like to go to a certain month or section, just use the Archives pop-up menu located in the sidebar to choose the month you’d like to read. You can click through the posts in order by using the links located at the upper right corner of each post. I’m in the process of removing past quilt-along instructions, so if you see quilting instructions in the posts for the year 1951, just ignore them. The diary is currently in the year 1954, so follow along with the daily entries to see what Hazel is doing. And be sure to check back on the third Sunday of February for Block 2 of the “Hazel’s Diary” quilt! Victoria F-Wolfe mentioned your blog and showed us a pic of the amazing BOM “Hazel’s Diary”. I know I won’t be going back to the other years but how do I join in the 1954 quilt – I don’t have access to the Kansas City Star. Love what you are doing!!!! Went to the KC Star and found the words for the pattern but no diagrams, templates or pictures of the block.Do I need to buy the paper this year? Last year you could get it the first week then pay after that. Either way I just need to know so I can get the pattern for the block. Thanks.